Official synopsis: "Like his mother, Jem, when he looks in people's eyes, Adam can see the dates of their deaths. It's hard enough living with this terrible gift, but life is about to get tougher. Adam sees that everyone around him has the same date - January 2027. Something huge is going to happen. Something bad. But what is it? And what can he do about it?" I absolutely devoured the first book in this series and thought it was absolutely amazing. The Chaos blew it out of the water! Honestly, this book is too amazing for words, but I will struggle to try and get across what I feel about this book. The writing, just as with Numbers is brilliant. It's perfectly crafted, and utterly captivating. Epic is the word that comes to mind. The Chaos is just so captivating, so high-octane and... addictive, I fought so hard whenever I had to put it down. I just couldn't. I really couldn't. Adam has his mothers gift, or more of a curse, and can see the dates when people will die. But when he sees that everyone around him has the exact same date, he realises that something major is about to happen. As I said earlier in the review, it is epic and I would kill (not literally) to see a film adaptation of this. I think it would be brilliant, and make for a great viewing experience. Reading this book isn't like reading normally. It is exactly like watching a movie, which is why I think it would make the transition from page to screen well. 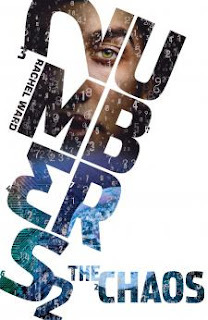 If you are going to read this, might I recommend you read the first book, Numbers (review here) first, as some aspects will confuse you if you haven't! The design of these books is amazing. The logo. The imagery. Just brilliant. They look fantastic on the bookshelf! All I can say is that I cannot wait to read what Rachel Ward has to offer next. I'm hopeful for a third Numbers book as these have become some of my favourite books of all time. Thank you to Claire at Chicken House for my copy! i really like the first book 'Numbers'. the ending was really sad and i am so desperate to read the next book, but i cant find it. does anyone know where i can get it from? ?